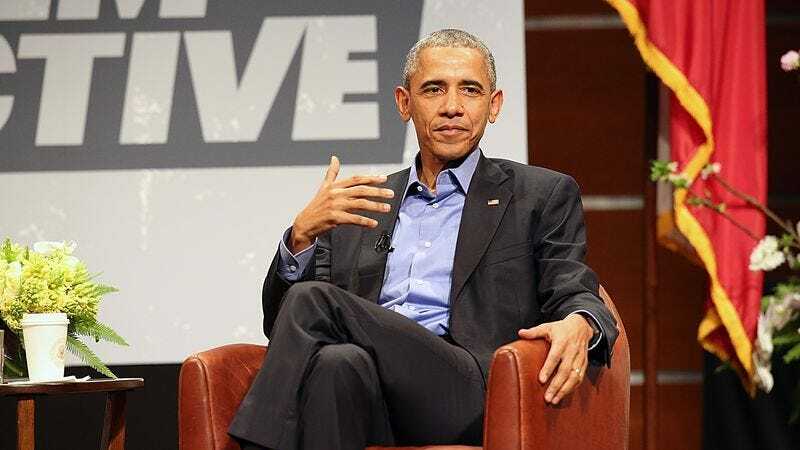 With less than five months left on the clock, President Barack Obama has officially slipped into the “Hey, let’s just do something cool” phase of his eight-year stint as president. Earlier this year, he and First Lady Michelle Obama both attended the massive media conference known as SXSW, indulging in their love of free swag, Richard Linklater movies, and whatever “disruptions” are. Now, Obama has announced that he’s creating a mini-SXSW of his own, in his own backyard (complete with blackjack and old Futurama jokes). South By South Lawn—which is admittedly a pretty clever name—is happening at the White House on October 3, and will feature panel discussions, short student films, and live performances, centered around the three SXSW standbys of Interactive, Film, and Music. Submissions for the festival are currently open, so if you’ve ever wanted your band to jam out on the same patch of hallowed grass that America’s most competitive egg hunters scour for treasure every Easter, now’s your chance.